Our stainless steel Insulated Tumbler 8oz will be the mug you sip your morning doppio or flat white from, and the cup you use when you're ready for an old fashioned or barrel-aged beer. Our high performance double-wall vacuum insulation will keep drinks hot for 2 hours and iced for 10 hours. We electropolish the interior, a safe and non-toxic process, to make it easy to clean. 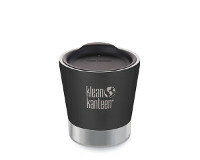 Our included Tumbler Lid keeps splashing to a minimum and fits all our Insulated Tumblers and Steel Pints (16/20oz).